Tongue statues are teasing the date of June 29, but why? The Rolling Stones have already mapped out dates in the U.S. for their upcoming "No Filter Tour," but the sudden appearance of the band's iconic logo in Toronto have fans wondering if a Canadian show could be added to the itinerary. 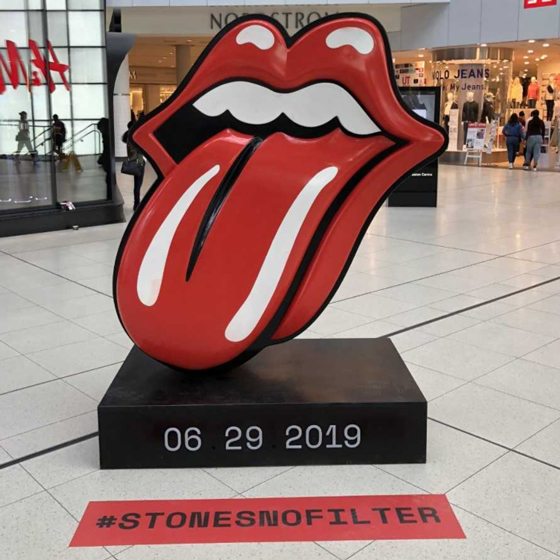 Statues of the band's recognizable tongue and lips graphic have appeared at both the Eaton Centre and Union Station, accompanied by a date pointing to June 29 of this year. The statues also encourage fans to post their findings to social media using the hashtag #StonesNoFilter. UPDATE (2/11, 8 a.m. EST): The Rolling Stones have now confirmed they will indeed be playing an Ontario show on June 29 at Burl's Creek Event Grounds in Oro-Medonte. You can get all the details here. The Stones' tour itinerary currently lists no dates past June 25. That day will see the rock legends play the second of two dates at Chicago's Soldier Field. It isn't impossible to suggest that the group use the four days in between that date and the one on the statues to take a trip north of the border. While we await further details, you can find the band's tour itinerary here, and you can see photos of the Toronto statues below. The Stones last delivered their Blue & Lonesome LP in 2016.